Just a short time after airing an amusing commercial featuring a seemingly invisible Mindy Kaling and the always-handsome Matt Damon, Nationwide Insurance released its second commercial of the night. Now, Nationwide is here to tell us we should “make safe happen," so kids don’t die in accidents. Check out the extremely disconcerting and uncomfortable ad, below. This commercial features a kid acting in a depressive manner, noting he’ll never learn to ride a bike or get married. The punchline? He’ll never actually be able to get married, because he actually died in an accident as a child. 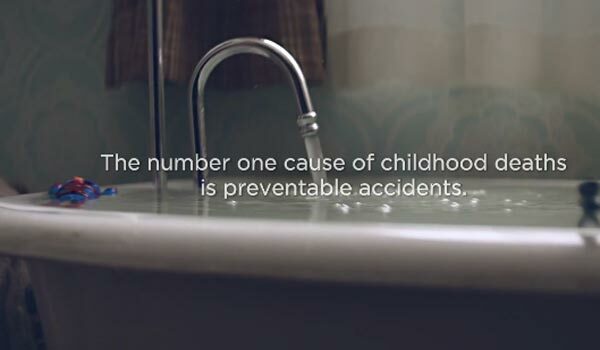 To really push the point home, Nationwide includes shots of a bathtub overflowing and of chemicals being readily available under the sink to make sure that parents are aware of the potential hazards that could easily harm their children (don’t worry, there’s insurance for that). The goal isn't awful, but it doesn't come across well. Nationwide Insurance announced a few days ago that they would debut an app and informational site for its new program “Make Safe Happen” to educate parents about the potential household hazards that can cause major problems and sometimes even death. Regardless, the forum and the setup (which feature a cute kid doing goofy activities) make the commercial pretty painful to get through. First and foremost, the commercial aired during tonight’s big Super Bowl game. Most people spent the evening sitting on couches, high-fiving and eating. The Super Bowl is expected to be a lighthearted and entertaining evening, not an educational one, and the commercial just didn’t fit in next to the Kim Kardashian and Budweiser commercials that also aired during the game. While a few serious commercials, including the "No More" domestic abuse commercial, were serious without seeming off-putting, Nationwide's ad was not. The big problem is that none of the actual program literature is on display in the commercial, so it comes off as a commercial about insuring your children in case there is a horrible accident and they die. If the company wanted to go for shock value, they certainly got it, but it’s difficult to make a connection between that and the Mindy Kaling and Matt Damon commercial that aired earlier on Sunday night. That one is pretty cute, featuring Mindy Kaling thinking she is invisible and having the time of her life. Tonally, that ad suits the Super Bowl, and doesn’t connect to the second Nationwide ad in any way. Honestly, if there’s anything that can explain how horrifying the Nationwide ad was tonight, it’s this tweet. McDonalds: "If you hug your dad, your meal is free today." Nationwide: "Your dad just died." Child safety is obviously an important issue, but using child safety as a forum to sell insurance during a football game is a bizarre choice. Especially since we have an idea of how much money companies are shelling out to air these ads.